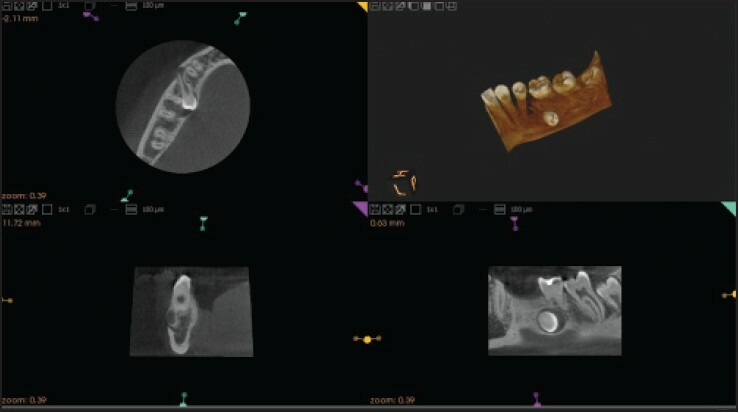 The purpose of the present report was to describe the radiographic and histopathologic features of a case of pericoronal radiolucency associated with an impacted mandibular premolar tooth. A systemically healthy 16-year-old female patient was admitted to our clinic for a routine check-up. Patient history revealed that she had orthodontic treatment and at that time, her orthodontist told that she has an impacted tooth. As the tooth did not interfere with orthodontic treatment and as she did not have any complaints, extraction was not recommended at that time. Extraoral examination did not reveal any abnormality. On intraoral examination, absence of both mandibular second premolar teeth was evident. A panoramic radiograph was made in order to evaluate the impacted tooth and a pericoronal radiolucency associated with the impacted right mandibular second premolar tooth was detected. The boundary of the pericoronal radiolucency was distinct but not corticated, and had a diameter of approximately 0.5 cm. The impacted tooth was located horizontally at the level of the roots of the right mandibular first molar, first premolar, and canine teeth, and distally directed orientation of the tooth crown was evident [Figure 1]. Review of the patient records revealed that a panoramic radiograph was made four years ago, just before the orthodontic treatment, and another one was made two years ago, during the treatment. The initial radiograph showed the right mandibular deciduous second molar tooth, and the incomplete crown of the right mandibular second premolar tooth that was pointing distally. The pericoronal space of the tooth was normal. On the left mandibular side, the second premolar tooth was missing and the mesial root of the deciduous second molar tooth was resorbed [Figure 2]. On the panoramic radiograph made two years ago, the crown formation of the right mandibular second premolar tooth was almost complete and a slight enlargement of the follicular space was seen [Figure 3]. A cone beam computed tomography scan was requested in order to determine the exact position of the impacted tooth. Examination of the axial, coronal, and cross-sectional images revealed that the right mandibular second molar tooth was obliquely impacted with its crown lingually and the root buccally at the level of the middle thirds of the right mandibular first molar and first premolar teeth. The crown of the impacted tooth was neighbouring the mesial root of the right mandibular first molar tooth and the apical portion of the impacted tooth was close to the root of the right mandibular first premolar tooth. In addition, the root of the impacted tooth was in contact with the superior border of the mandibular canal and the root apex of the tooth was located just above the mental foramen. A radiolucent, smooth contoured but uncorticated rounded lesion with 3.4 mm at its greatest diameter was detected surrounding the crown of the impacted tooth. The root formation of the impacted tooth was almost complete but the apex of the tooth was not closed yet [Figure 4]. The differential diagnosis was enlarged follicle and dentigerous cyst. The patient was then referred for surgical operation. Full thickness mucoperiosteal flap reflection on the buccal and lingual sides and bone exposure was accomplished. Bone over both the crown and the root apex was removed. A straight elevator is placed in the groove that was prepared using a rounded bur and the tooth was removed lingually through the bone window. Mental nerve and mental foramen were preserved using a Farabeuf retractor; lingual flap and lingual nerve were preserved with the help of a periosteal elevator. Follow-up appointments held one day and 7 days after surgery showed that healing was uneventful without any neurosensory deficit. On macroscopic examination, the specimen was a soft tissue material attached to a premolar tooth [Figure 5]. 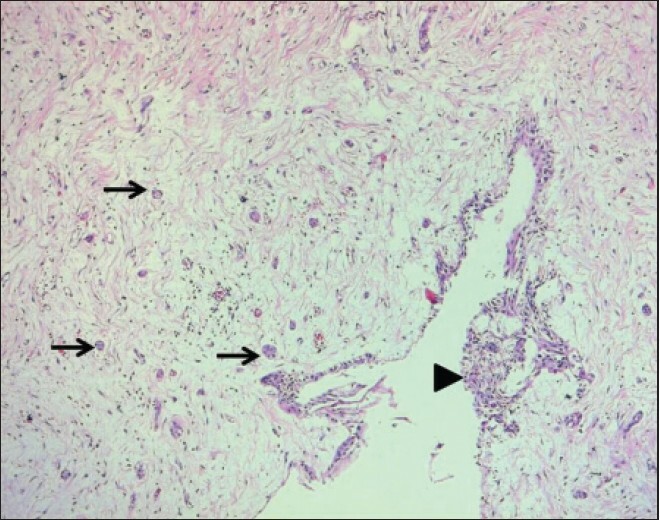 On hematoxylin and eosin staining, numerous odontogenic epithelial rests were seen on a mixoid connective tissue that has a minimal mononuclear inflammatory cell infiltration [Figure 6] and [Figure 7]. The definitive diagnosis was hyperplastic dental follicle. Dental anomaly patterns (DAP) are described by Peck  as "associated dental abnormalities that are observed together much more frequently than can be explained by chance alone." Unilateral agenesis of mandibular second premolar, distal angulation, and delayed development of the unerupted contralateral second premolar is now considered as one of these dental anomaly patterns. ,, In the case presented, all the mentioned features were evident on the panoramic radiograph made when the patient was 12 years old. Hence, the case presented is an example of DAP. In addition, the mesiodistal diameters of the incomplete crowns of the third molars were shorter than the erupted molars. One of the treatment options for the management of mandibular second premolar impaction is to uncover the tooth surgically and to move it into the arch by orthodontic treatment. In the present case, the need for primary molar extractions due to the root resorption of the primary left second molar, agenesis of the left second premolar, and incomplete root formation of the impacted premolar were probably the factors that did not permit surgical exposure and orthodontic alignment of the tooth at the time of orthodontic treatment. Observation is another option for the management of impacted teeth. However, our literature research did not reveal any adopted protocol for the radiographic assessment of impacted teeth. 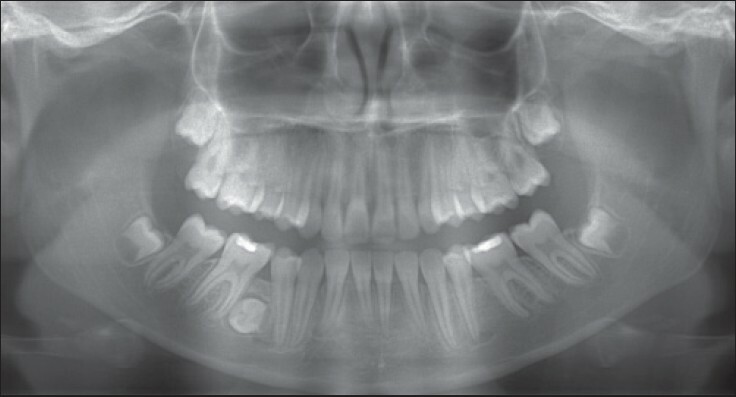 In the case presented, the patient had an initial panoramic radiograph and another one made at the end of the orthodontic treatment, made with two-year interval. Two years later, she admitted to our clinic for a routine check-up and radiographic examination revealed the pericoronal radiolucency associated with the impacted tooth. Extraction of impacted premolars may be challenging. Radiographic examination plays a major role in planning the surgical procedure. Knowing the position of the impacted tooth is very important in planning the incision. In the case presented, cone beam computed tomography examination revealed the exact position of the tooth besides close proximity to the mental foramen and mandibular canal, and the lingual approach was taken. 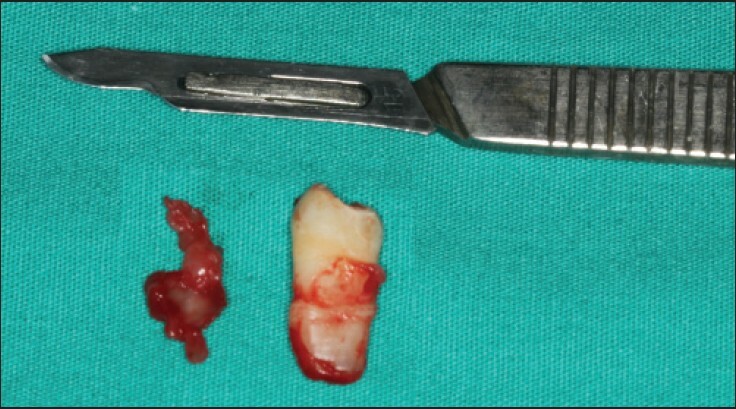 Keratocystic odontogenic tumor occurs in a wide age range, but most of them develop during the second and third decades and has a slight male predominance; more than half of them are in the ramus region. Although the lesion may surround the tooth pericoronally, it is connected to the tooth at a point apical to the cementoenamel junction. , Therefore, the demographic and radiographic features of the case presented was not consistent with odontogenic keratocyst. Unicystic ameloblastoma is a rare variant of ameloblastoma and it usually occurs in a young age group, with about half of the cases occurring in the second decade of life. Most of them are located in the mandible. Cases associated with tooth impaction can be encountered, the mandibular third molar being most often involved. Due to the rarity of the lesion, inconsistency with the usual location, and relatively younger age of our patient, unicystic ameloblastoma was not ranked high in the differential diagnosis. Ameloblastic fibroma mostly occurs during the period of tooth formation with an average age of 15 years. Radiographically, ameloblastic fibroma usually appears as unilocular or multilocular radiolucency with well-defined and corticated borders in the premolar-molar area of the mandible. The lesion may be located in a follicular relationship with an unerupted tooth. , Although the lesion lacks a well-defined and corticated border in the present case, ameloblastic fibroma may be included in the radiographic differential diagnosis. 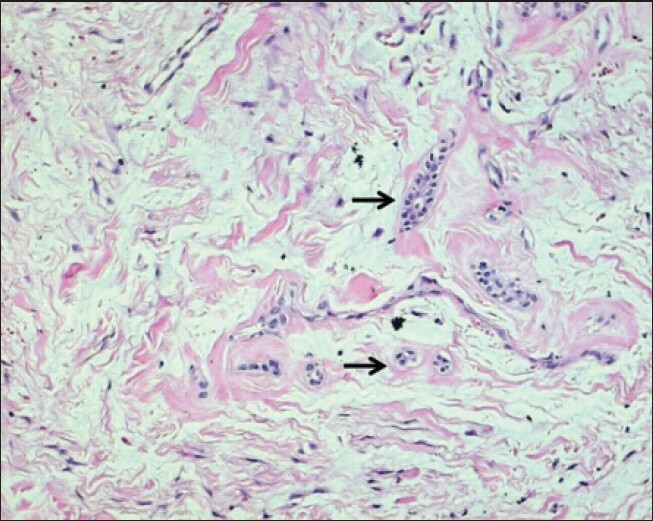 Hyperplastic dental follicle is an unusual hamartomatous lesion. The mechanisms causing hyperplastic dental follicle are not definitively explained. The condition may involve just one tooth or may be associated with multiple teeth. Downregulation of matrix metalloproteinases in hyperplastic dental follicles are suggested to result in abnormal tooth eruption. In the present case, the distal angulation of the tooth seems to be responsible for impaction of the tooth. Nevertheless, further studies may be able to shed light on the association of this DAP with hyperplasia of the dental follicle. In conclusion, awareness of dental anomaly patterns may change the radiographic interpretation process, diagnosis, and subsequent treatment planning significantly. The clinicians should investigate all teeth that fail to erupt at the expected time, and initiate appropriate assessment and management of suspected lesions. 1. Navarro J, Cavaller M, Luque E, Tobella ML, Rivera A. Dental anomaly pattern (DAP): Agenesis of mandibular second premolar, distal angulation of its antimere and delayed tooth formation. Angle Orthod 2014;84:24-9. 2. Aslan BI, Akarslan ZZ. Teeth number anomalies in permanent dentition among non-syndromic dental patients. Coll Antropol 2013;37:115-20. 3. Wasserstein A, Brezniak N, Shalish M, Heller M, Rakocz M. Angular changes and their rates in concurrence to developmental stages of the mandibular second premolar. Angle Orthod 2004;74:332-6. 4. Shalish M, Peck S, Wasserstein A, Peck L. Malposition of unerupted mandibular second premolar associated with agenesis of its antimere. Am J Orthod Dentofacial Orthop 2002;121:53-6. 5. Topkara A, Sari Z. Impacted teeth in a Turkish orthodontic patient population: Prevalence, distribution and relationship with dental arch characteristics. Eur J Paediatr Dent 2012;13:311-6. 6. McNamara C, McNamara TG. Mandibular premolar impaction: 2 case reports. J Can Dent Assoc 2005;71:859-63. 7. Kale T, Patil S, Verma A, Muttagi S. Bilateral maxillary premolar impaction - reporting a rare case. International Dentistry - African Edition 2012;2:82-6. 8. Wali GG, Sridhar V, Shyla HN. A study on dentigerous cystic changes with radiographically normal impacted mandibular third molars. J Maxillofac Oral Surg 2012;11:458-65. 9. Wood NK, Kuc IM. Pericoronal radiolucencies. In: Wood NK, Goaz PW, editors. Differential Diagnosis of Oral and Maxillofacial Lesions. 5 th ed. St Louis, MO: Mosby; 1997. p. 279-95. 10. White SC, Phaorah MJ. Oral Radiology: Principles and Interpretation. 6 th ed. St Louis, MO: Mosby; 2009, p. 348. 11. Sun CX, Ririe C, Henkin JM. Hyperplastic dental follicle - review of literature and report of two cases in one family. Chin J Dent Res 2010;13:71-5. 12. Peck S. Dental anomaly patterns (DAP). A new way to look at malocclusion. Angle Orthod 2009;79:1015-6. 13. Garib DG, Peck S, Gomes SC. Increased occurrence of dental anomalies associated with second-premolar agenesis. Angle Orthod 2009;79:436-41. 14. Min JH, Huh KH, Heo MS, Choi SC, Yi WJ, Lee SS, et al. The relationship between radiological features and clinical manifestation and dental expenses of keratocystic odontogenic tumor. Imaging Sci Dent 2013;43:91-8. 15. Ramesh RS, Manjunath S, Ustad TH, Pais S, K Shivakumar K. Unicystic ameloblastoma of the mandible - an unusual case report and review of literature. Head Neck Oncol 2010;2:1. 16. Rao SP, Srivastava G, Smitha B. Ameloblastic fibroma. J Oral Maxillofac Pathol 2012;16:444-5. 17. Kim SG, Kim MH, Chae CH, Jung YK, Choi JY. Downregulation of matrix metalloproteinases in hyperplastic dental follicles results in abnormal tooth eruption. BMB Rep 2008;41:322-7. 18. Odell EW, Morgan PR. Biopsy pathology of the oral tissues. London: Chapman & Hall Medical; 1998. p. 429.